Hope you enjoy this fun design. 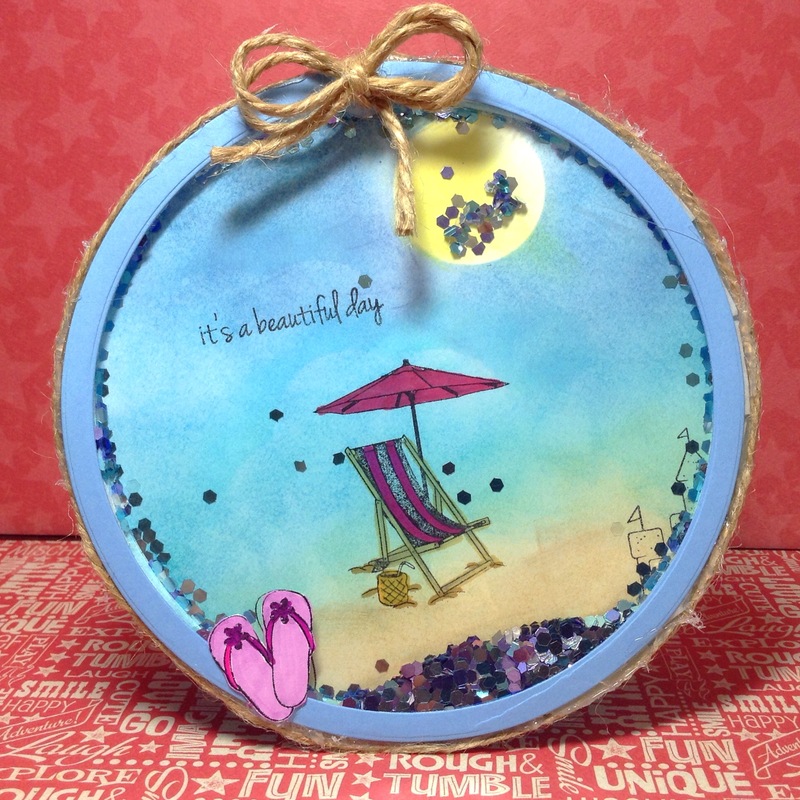 Create your beach background on your white circle using your distress inks. Stamp and color your beach chair. 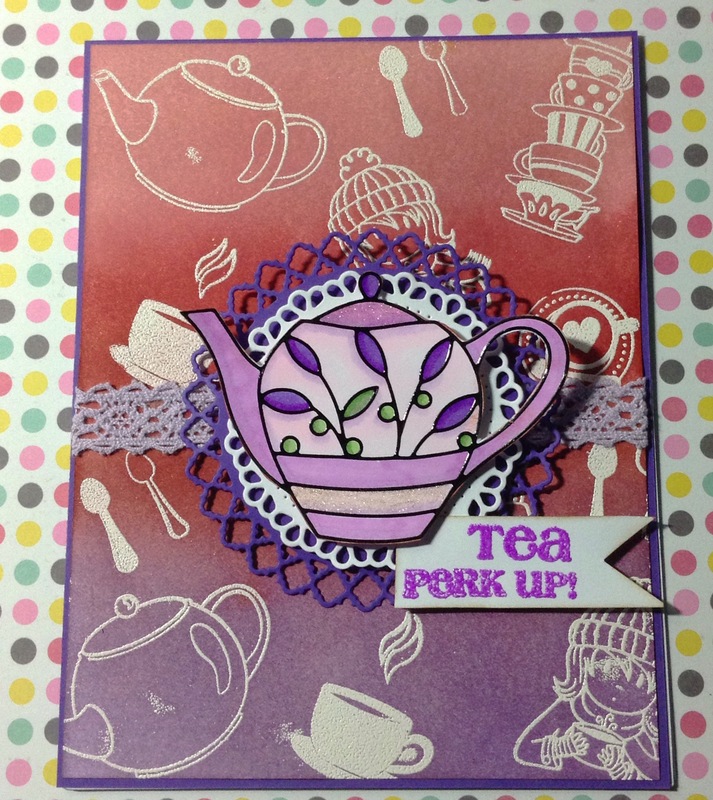 Assemble your shaker card and decorate the edges and border. Our focal image today will be an uncolored outline sticker. For assembly, I cut all of my pieces first. 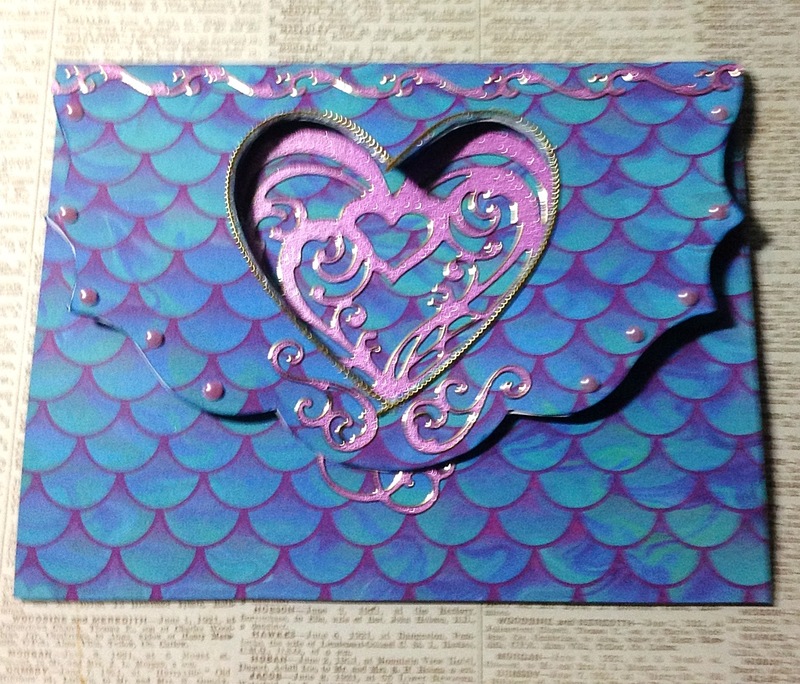 I embossed all of my white card stock and then mounted them onto my mirror board. The smallest square I did not emboss to showcase my outline sticker. Great card for an outdoor wedding, shower, birthday or friendship. Just another quick sample of outline stickers on patterned paper. I used the shimmer pen to highlight different parts of the teapot. Accent with some diamond border stickers and you have a quick card to share. Happy Father’s Day to all of the Dads. I wanted to share some outline stickers on patterned paper. This card is quick and easy. 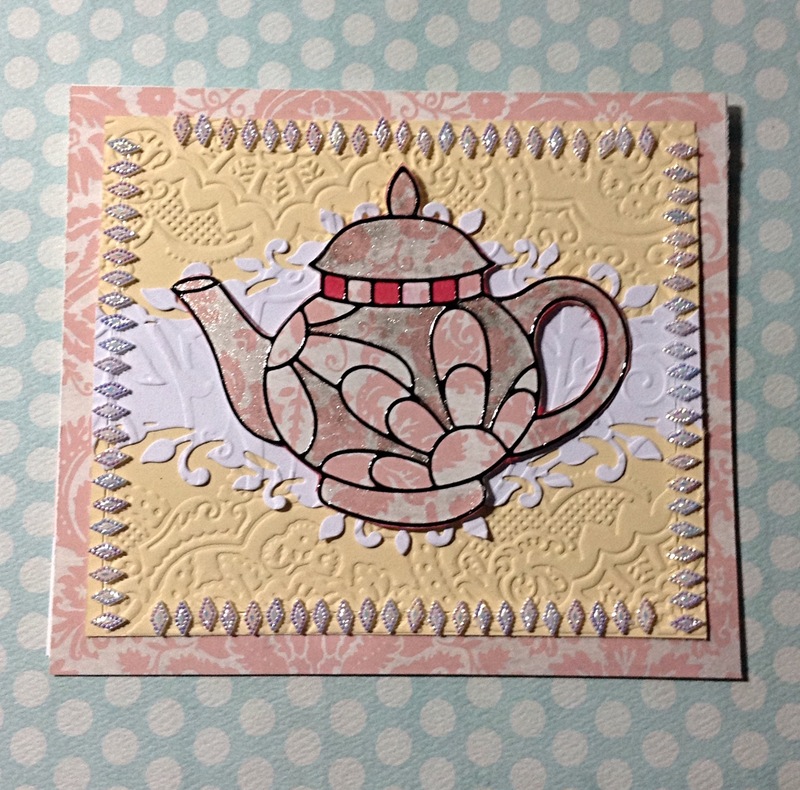 Trace your flap onto the back of a patterned paper, fussy cut and then attach to your base card. Make sure to do both sides. 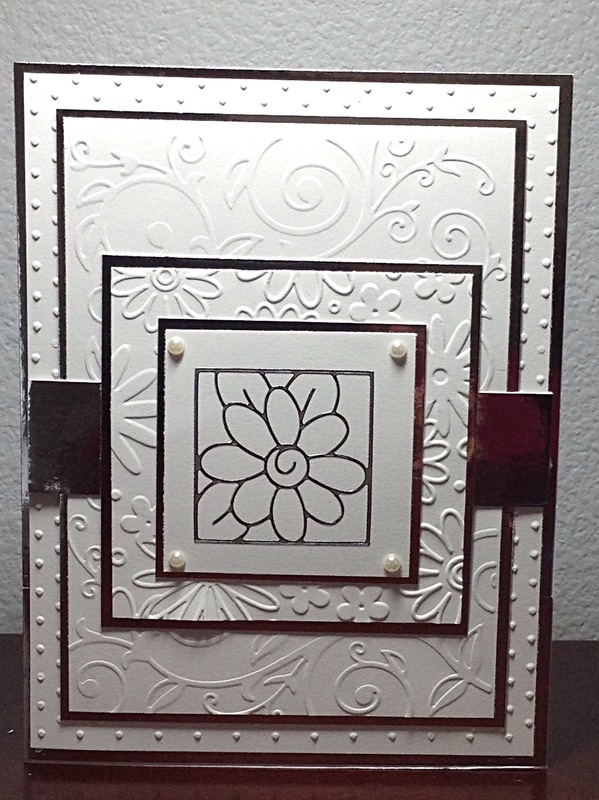 Cover all panels of the card and then decorate. Remember to share your sunshine, we all have plenty! To continue the outline sticker theme of the week, we are highlighting the outline stickers on regular paper versus glitter paper. A lot of fun techniques in this card. We have emboss-resist, ombre inking, die cutting and coloring. 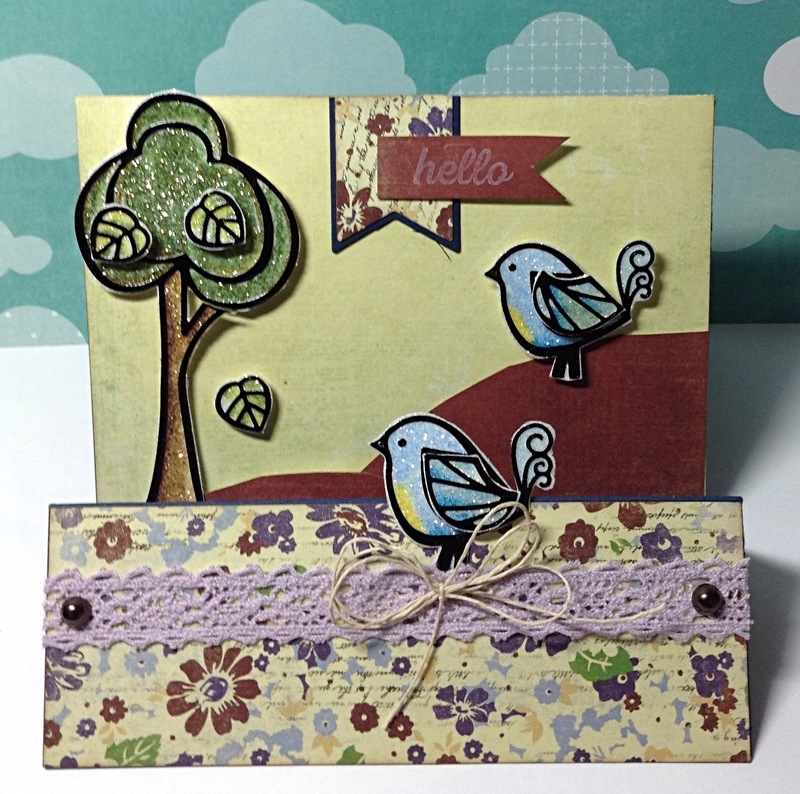 This multilevel card features the Birds With Trees outline stickers from Krazy Kreations. 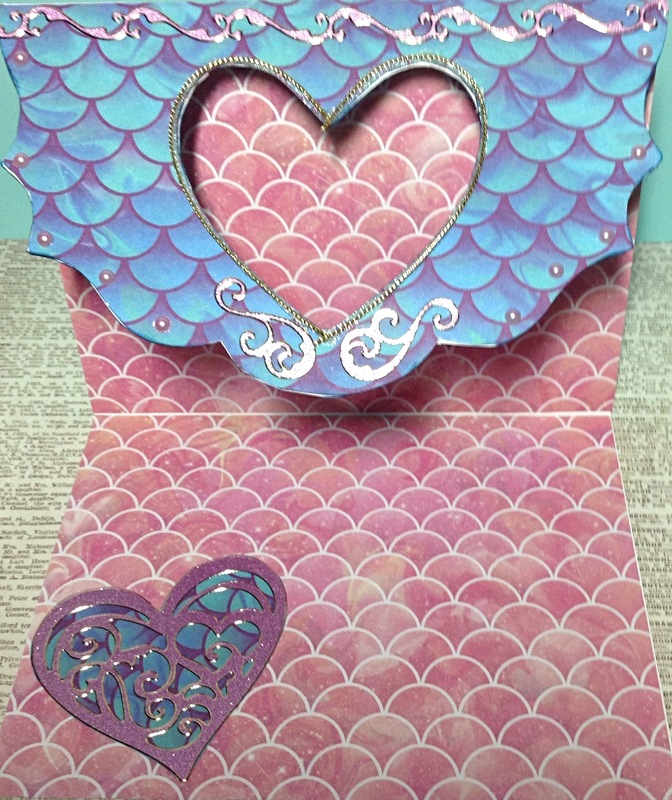 Before you put your card together, attach your outline stickers to your glitter paper, color them and cut them out. I used 2 birds, 2 wings, 1 tree and 3 leaves. For my base, I used a navy blue card stock. Score your base at 3 1/2, 7 1/2 and 9″. Fold your score lines. 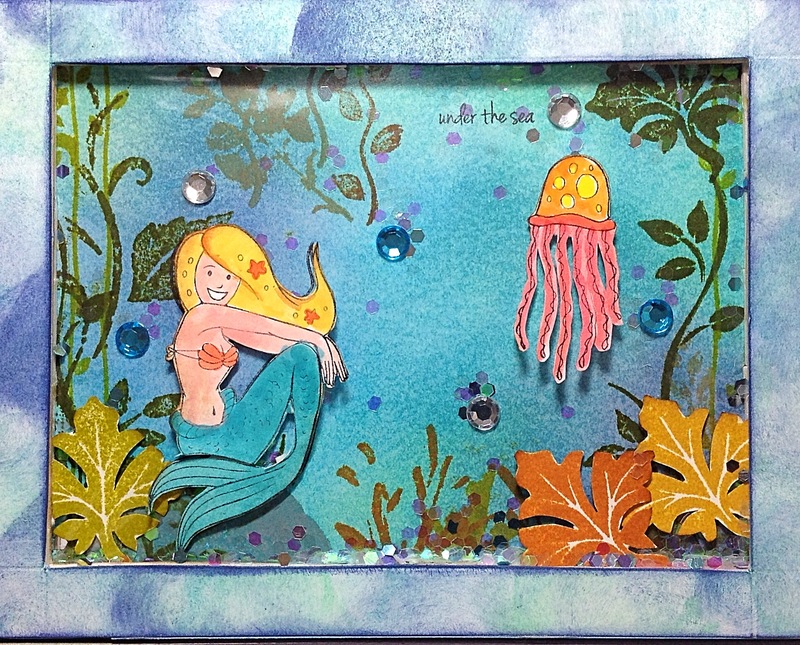 For my embellishment papers, I used the Fair Skies paperback by Farm House Paper. Attach to the base. Attach your large hill to the green background and then pop up your smaller hill. I used foam tape to pop up my tree, leaves and bird on the hill.Attach your front bird to your floral paper. I attached my doily tape to my floral piece and embellished with twine and pearls. For my sentiment, I stamped “Hello” from the Soaring Above Collection by The Rubber Cafe in white ink. Layer your banner tags and attach to the card. Finish off with your greeting. Have a great rest of the week! Don’t forget to share your sunshine. 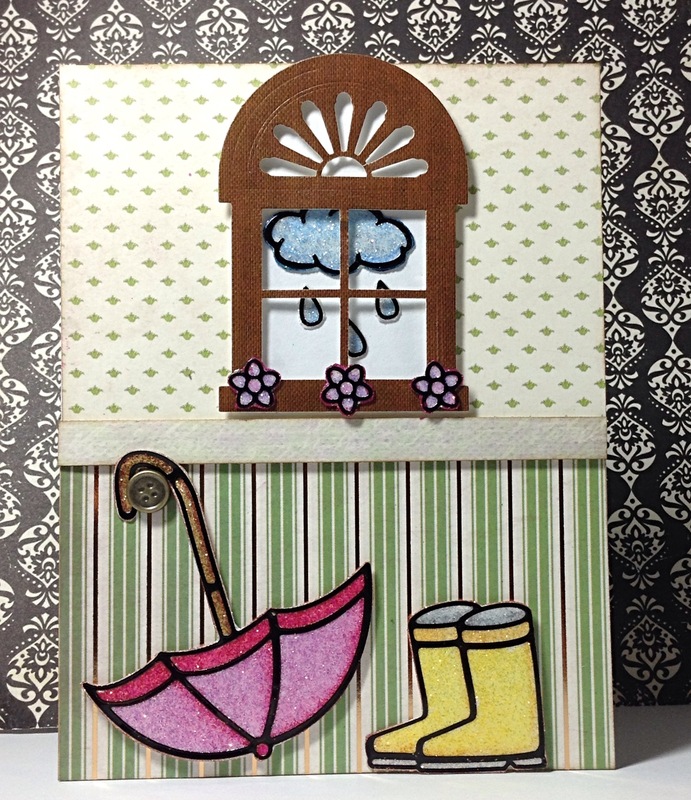 This card features the Rainy Days Outline stickers from Krazy Kreations. Supplies needed: window die cut from Spellbinders, Striped paper, polka dot or floral paper, pop dots, Button brad and alcohol markers. I used IG2, IG4, IG6, TB3, CT3, GB5, GB10, DR1, PL2, TN8, LV1, LV2. Have a great day and make it your goal today to make someone else smile. The theme for this week will be outline stickers. Outline stickers are a great way to craft and get your coloring fix all at once. 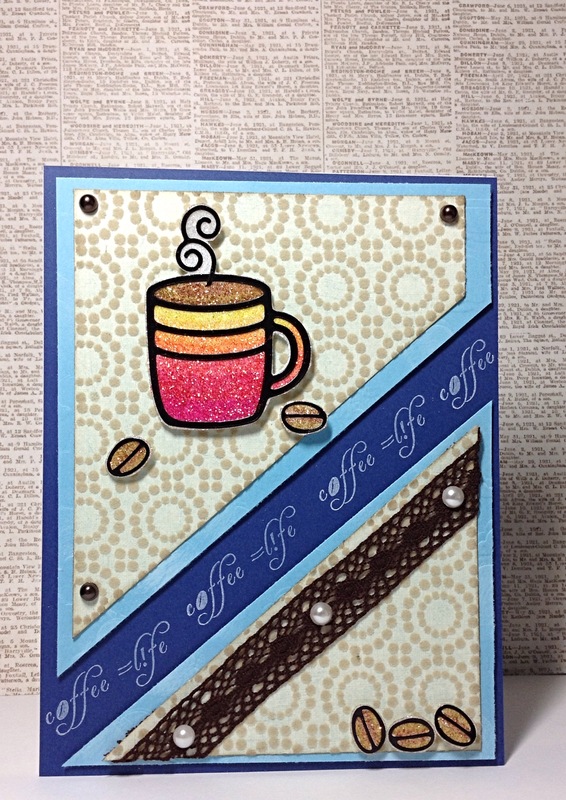 This card features my favorite beverage…COFFEE!!! Another version of the double pocket card. This card uses a few more die cuts than the other card. I did make 3 tags for this card so that each of us has a tag to decorate for my hubby. Tools used include: double pocket template from Paper Wishes , Banner Party stamps by Fun Stamper’s Journey (FSJ), Pennant Die by FSJ, Just Men stamps by The Rubber Cafe, Chalk Studio by My Mind’s Eye, Tags by Sizzix, Letter dies by Tattered Lace, Star punch and twine. Please share you Father’s Day Creations.